Apple recently updated its baseline 13-in. 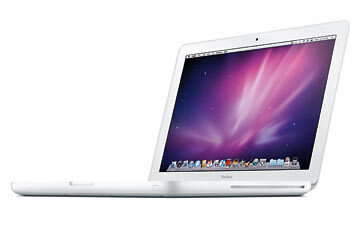 MacBook with a unibody polycarbonate shell for added strength and style. Inside, an efficient LED-backlit screen helps lift battery life to seven hours and provides instant full-screen brightness the moment you turn it on. The new MacBook is greener than previous models, having eliminated harmful toxins like mercury and now using arsenic-free glass. Among its other consumer-friendly features is a spacious glass trackpad that registers multiple-finger inputs like two-finger swipes (for up or down) and four-finger swipes (to choose among open applications).